Giant Eagle has teamed up with OfferUp to make a large number of its stores meeting spots for the Bellevue, Wash.-based mobile marketplace. The companies said yesterday that consumers buying or selling items in the OfferUp mobile app can go to designated Community MeetUp Spots at 91 Giant Eagle, Market District and GetGo stores to complete their transactions in a secure location. According to OfferUp, millions of people use its platform daily to buy and sell items to friends and neighbors but also new acquaintances, making trust and safety a key to the service. The Community MeetUp Spots are under 24-hour video surveillance to provide monitored, well-lit places of exchange. Local buyers and sellers can find MeetUp Spots in 50 Giant Eagle and Marketplace stores and 41 GetGo fuel and convenience locations in Cleveland, Pittsburgh, Indianapolis and Columbus, Ohio.The meeting areas are situated in the in-store cafés of each location and highlighted with signs. 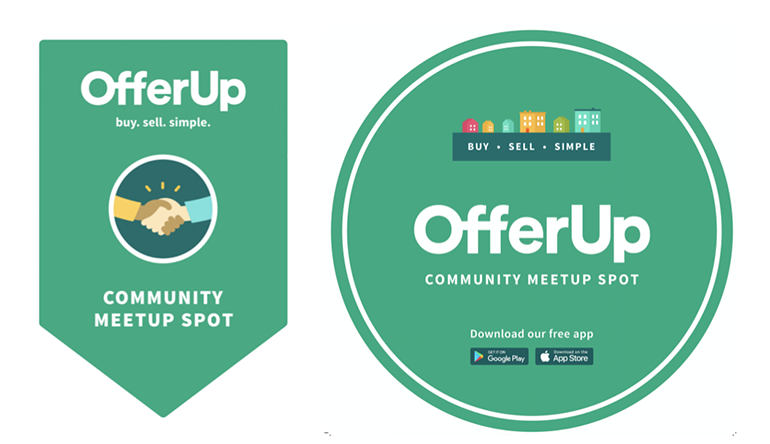 OfferUp's Community MeetUp Spot banner and floor signs. In support of the partnership, OfferUp users are being offered a digital coupon for a free 16-ounce bottle of Market District ready-to-drink tea or lemonade from Giant Eagle when they make plans to meet at a participating store. The limited-time coupon, available via OfferUp's in-app chat feature, can be redeemed at a Giant Eagle, Market District or GetGo location when buyers and sellers meet to exchange items. “OfferUp’s partnership with Giant Eagle is the first of its kind between a local marketplace and leading supermarket retailer,” said Natalie Angelillo, vice president of community at OfferUp. Earlier this year, OfferUp created SafeTradeSpots.com, which it calls the largest national database of locations for in-person transactions. The company said it works with over 1,400 police departments to designate and manage meeting spots, and adding retail locations like Giant Eagle to the list of secure exchange points increases the app’s safety features. Those include identity confirmation, user ratings and reviews, and secure in-app messaging, which lets OfferUp users communicate without having to share personal information. “This is about providing our customers with value and convenience, regardless of whether they’re buying something from their neighbor, shopping for groceries or fueling up their tank,” Angelillo added. Overall, Pittsburgh-based Giant Eagle operates more than 410 stores, including over 200 supermarkets, in western Pennsylvania, north-central Ohio, northern West Virginia, Maryland and Indiana.